The current flag of Georgia was adopted on May 8th 2003, and consists of three red and white stripes with the state's coat of arms on a blue field in the top left corner. The current flag was adopted after a period of controversy over the previous two state flags. 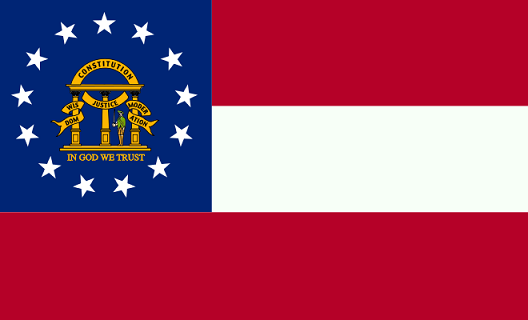 The Georgia flag of 1956 to to 2001 was considered offensive by some Georgia residents because of its prominent inclusion of the Confederate Battle flag, and the successor flag used from 2001 to 2003 was also unpopular with a vocal segment of Georgia's population. 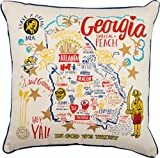 A vibrant Georgia-themed cotton pillow lending a state outline, flag-inspired background, and various illustrations and sentiments associated with the state throughout. Contains a cotton piped trim. Shipped vacuum sealed for protection. 20" x 20". Imported. Made of 100% Polyester. 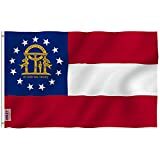 Package contains one ANLEY 3x5 Ft Fly Breeze Georgia State Flag.